In 2010, LeBron James took to ESPN to let Cleveland know—in the most public way possible—that he wouldn’t be returning to the south shores of Lake Erie. Shortly thereafter, Cavaliers owner Dan Gilbert unleashed a now-infamous comic sans screed, ripping James and going scorched-earth on Cleveland’s only real chance to end a championship drought that stood at 46 years. I wish I could describe the way I felt after Game 4. After the Cavaliers responded with a punch in the mouth in Game 3, Cleveland trudged through Game 4 to mount a two-point lead with ten minutes remaining. The Warriors promptly outscored them 15–3 over the next seven minutes, and it felt like the end. If you can’t win a ten-minute game at home, how on earth do you expect to beat a team three consecutive times that hasn’t coughed up back-to-back-to-back losses since November 2013? (Not to mention, two of those three losses were without Unanimous MVP Steph Curry.) Oh, and by the way, two of the three games you need to win are in Oakland, a place where this team lost only twice in 41 tries all season. Oh, and by the way, no team in the history of the National Basketball Association has ever won a Finals series after being down 3–1. Good luck. Throughout the 2015 and 2016 playoffs, I had been cycling through my Cavaliers jerseys until I landed on a “lucky one,” which I then would wear until the team lost. It seemed to work pretty well. After Game 4, I gave up. There wasn’t a jersey or Cavs t-shirt that was going to reverse decades of NBA history or Cleveland curses. It was maybe my most defeated moment as a Cleveland fan, and that’s saying something. Despite everything the Cavs were up against, my Cleveland optimism couldn’t let me give up. In the face of scorching defeat, I’m always optimistic. You have to be if you watch sports in this city. Of course, this optimism usually only leads to more agony, as every year I get my hopes up just to have them snuffed out in a variety of horrific ways. This year, that optimism kept me alive. You see, heading into Game 5, the Cavaliers had yet to win in Oakland. LeBron had won at least one road game in each of his last 25 playoff series. As I explained to a friend, we just had to cash in on our guaranteed road win in Game 5, come back and protect home court in Game 6, and take our chances in Game 7 since we have the best player on the planet and Kyrie Irving. There’s our path to redemption, now let’s go get it. Game 5 was on June 13th. I cut the grass that day. I know this because I was wearing my grass cutting outfit. I had my grass cutting shoes (everyone has them), an old pair of athletic shorts stained with paint, and a light blue Predicate tank top to keep the pits breezy in the hot sun. I finished in the yard and relaxed on my patio where later I would watch the Cavaliers turn the ship around in Oakland. It was incredible. The Golden State Warriors’ points by quarter in Game 5: 32, 29, 23, 13. I was watching the best team in NBA history get sapped of life in front of my eyes. Following drama from LeBron and Draymond Green, Klay Thompson ran his mouth in a press conference, and LeBron had been deemed a petulant baby by Warriors faithful. They booed him every time he touched the ball, in warmups. By the end of Game 5, there was no more booing. LeBron dropped the hammer with 41 points, 16 rebounds, and seven assists. Kyrie Irving had one of the most absurd games I’ve ever seen, chipping in 41 points of his own on a ridiculous 17–24 shooting clip, while going 5–7 from behind the arc. It was the best shooting performance in Finals history. No matter what happened the rest of the way, the Cavs got a couple of games against a historically great team, and Kyrie turned in a heroic game. Even if we couldn’t win the series, it’s hard to be too mad about that. We had a pulse. I set aside my entire outfit (socks, underwear, and all) because it had suddenly become a bastion of good luck, and we’d need it for Game 6. Coming back home, I was optimistic. We had already coughed one up at The Q, and I couldn’t imagine LeBron & Co. would do it twice, allowing Golden State to celebrate a championship on beautiful Cleveland soil for the second straight year. There are certain things LeBron doesn’t allow to happen, and that seemed like one. I was excited. The tweets from Oakland beat writers let me know I was in for a treat. I'm told Warriors have been locked in since they got on the plane to come to Cleveland. No family. No distractions. Just focused. I don’t know how on earth you can be “locked in” on a plane ride, but the Warriors certainly thought they were. The Golden State family bus wasn’t even let into the arena until 9 p.m., roughly ten minutes before tip-off. If not seeing your family cranks up the focus, the Warriors were locked in like Fort Knox. In the words of Fear The Sword, the Warriors “got two pieced in the first five minutes.” The Cavs opened the game on a 31–9 run, if you could even call it that, and only an Andre Iguodala shot with three seconds remaining got the Dubs to double-digits in the first quarter. The game was over as quickly as it had started. The defending champions came to Cleveland expecting to cement their dynasty and instead got trampled in the kind of game where Dahntay Jones scores five points in 11 seconds in the second quarter. Suddenly, after facing imminent death at the hands of the unstoppable Warriors, things were headed back to California for Game 7, and now it was Cleveland with all the momentum. Don’t give LeBron a Game 7. Don’t force LeBron to play the role of the underdog. Don’t give LeBron any extra reason to snuff you out. Because he will. I had a good feeling about things. I thought we had a genuine chance to win. If we lost, I wanted to feel it with my fellow Clevelanders. If we won, I wanted the opportunity to experience the moment I’ve imagined for more than a decade. If The Mistake On The Lake finally got its championship, I’d never forgive myself if I weren’t there to experience it firsthand. So there I am in Downtown Cleveland with roughly 200,000 of my fellow fans, anxiously awaiting the biggest game in the last five decades of Cleveland sports, dressed in the same damn outfit I had cut the grass in six days earlier. I’m not a superstitious person, but this seemed like the proper time to pull out every single stop. I lugged the aforementioned Kyrie jersey along with me, figuring I could at least throw it on after the game, be it in triumph or a show of solemn support. 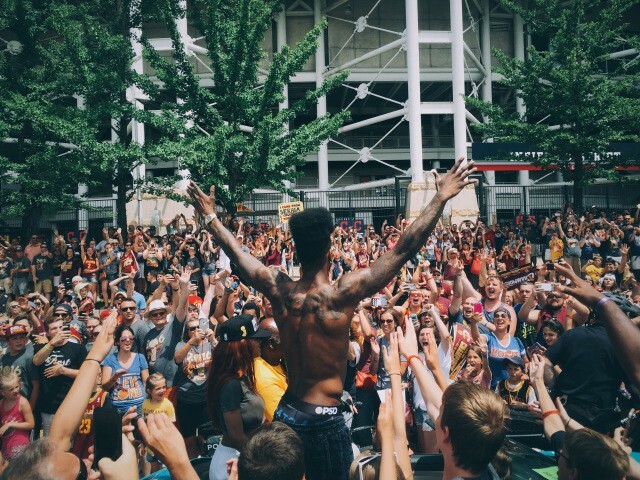 Cleveland is poised to riot in the streets, win or lose. The buzz is palpable. However this game goes, I know I’ll remember the next four or five hours for the rest of my life. So there’s the scene. I’m standing in a sweaty bar, wearing a smelly outfit, standing shoulder to shoulder with with my best friends and a bunch of strangers (who are now my best friends), hoping my beloved, cursed team can beat the best group in NBA history on their floor in order to unravel 52 years worth of agony. No pressure. Just relax. As a person who gets anxious ordering lunch at a drive-thru, much less watching a game involving one of my teams, Game 7 of the NBA Finals is basically torture. I get way too worked up watching sports, which means a game where every possession has the potential to either break Cleveland free from its shackles or add a new chapter to its Misery Montage is enough to have me practically on my deathbed. 48 minutes of good basketball stand between me and eternal sports bliss. Trust me, I'm totally fine and not scared to death at all. The Cavs came to play. Tristan Thompson and LeBron open up a quick four-point lead before Harrison Barnes and Draymond Green respond with a quick eight points. If those two are going to get hot, you’re in for a long night. Not a good sign. Fortunately, the Cavs have players like LeBron, Kevin Love, and Kyrie Irving, so they’re able to gut it out and cling to a one-point lead after the opening quarter. Now I start counting down. “Thirty-six minutes. Thirty-six more minutes and it’s over.” I’m counting the minutes out loud. Is there anything more frustrating than watching Draymond Green hit everything he throws up while your own shooters can’t manage to knock down a wide open shot? Amidst an abysmal three-point performance in the first half, Iman Shumpert converts a four-point play to give Cleveland another lead. With two and a half minutes remaining in the first half, it feels like the flood gates start to open up. What’s been a back and forth game quickly shifts in Golden State’s favor as the Warriors close the half on an 8–2 run to give them their biggest lead of the night. After battling back to force Game 7, it feels like the Cavs are running out of steam and out of luck. The first few minutes of the second half are going to determine if I’ll be spending the off-season basking or stewing. The second half starts and Cleveland opens shooting 5-for-6, including two incredible JR Smith three-pointers made possible by LeBron assists. Tie ballgame. Uproar at the bar. Silence at Oracle Arena. Timeout Warriors. Golden State isn’t going to roll over. Curry finally awakens, and the Warriors push out to a quick five-point lead of their own before a phenomenal 11–0 run by the Cavs somehow gives Cleveland its biggest lead of the game and triggers another Golden State timeout. It’s now really starting to hit me. Holy crap, we might actually do this. By this point, I’m a shell of my former self, sweating through the same outfit for the third time in a week, propped up against an ATM and a cigarette machine on the back wall of Liquid. I’m far past dehydrated and suffering from the most extraordinary case of dry mouth I’ve ever experienced. I have sweat running down the bridge of my nose, and the temperature inside the bar has risen to what certainly feels like triple digits. It would’ve taken a pilgrimage to push through the mass of bodies to reach the bathroom and nothing short of divine intervention to reach the bar itself. We’re going to have to ride this one out. Ohio Highway Patrol, in anticipation of brewing chaos, closes Cleveland. The Warriors fight back yet again, knotting it back up with two minutes left in the quarter, before snatching a one-point lead heading into the final frame. I feel like I might die. Cleveland starts the scoring in the fourth quarter with baskets from LeBron and Kevin Love. The back and forth continues like a tennis match. Kyrie basket. Draymond basket. LeBron basket. Curry basket. Klay Thompson basket. Draymond basket. Five and half minutes left in the season, and Golden State is giving their final push, opening up a four-point lead. By this point, I’m practically a spectator at a bar packed full of spectators. I’m too tired, thirsty, and anxious to keep up with the uproar after ever Cavs point or the anxious groans after every Golden State response. All I can do is watch nervously and offer half-hearted clapping. Meanwhile, in Oakland, the Cavs need an answer, and they’re running out of time. 87% of Cleveland is tuned into the game. LeBron is somehow able to bait Festus Ezeli into jumping on a three-point attempt, and he absorbs the contact and sinks the ensuing three freebies to cut the Cleveland deficit to one. Curry turnover. LeBron three-pointer. Cavs lead. Klay Thompson quickly responds to tie the game at 89–89 with 4:39 remaining and the game enters a full-blown gridlock. Neither side can manage a single point. You can’t help but get the feeling that the next team that can put one in the hoop is going to win the game. With two minutes left, Golden State gets its chance. Kyrie drives the lane and throws up a tricky off-balance floater that clanks into the hands of Andre Iguodala. He takes off down the floor, passes to Curry who quickly returns the ball, and goes up for a clean layup over JR Smith, thrown into a spin cycle on the fast break. LeBron James comes soaring in from the free throw line to pin the ball against the backboard in what has to be the most iconic play of his 13-year career. Simply unreal. I snap out of my anxious stupor and jump into the air with the rest of the bar. What easily could have been a Game 7 winner just got snatched out of the sky. The Cavs are still alive. LeBron James missed shot. Steph Curry bricked three-pointer. Cavs timeout. 1:09 remaining. Still tied at 89. It’s incredible to me that two teams can play 103 basketball games in a season and still have it all boil down to just a few seconds. The Cavaliers had played 298,611 seconds of basketball to that point, but not a single one mattered if they couldn’t win the next 1:09. Out of the timeout, Kyrie takes the ball. Klay Thompson, and JR Smith decides to change that. He comes in to set the pick, and now there are 60 seconds left in the entire season, and Kyrie Irving is 30 feet from the hoop staring down the NBA’s first unanimous MVP. Dribble. Dribble. Crossover. Crossover. Crossover. Dribble. Step-back. Shot. Bullseye. Kyrie rises up from behind the arc and finishes the biggest play in Cleveland sports history. The bar feels like it’s going to crumble, the Cavs have the lead with 53 seconds remaining, and I’ve got a knot in my throat. I’m choking back tears. Without taking a timeout, the Warriors get the ball in to Steph Curry, who dribbles up the floor and gets a pick from Draymond Green, forcing a switch onto Kevin Love. The Cavs have a three-point lead, the ball is in the hands of the best shooter in NBA history, and Kevin Love is guarding him. I’ve seen Love get roasted over and over again in this same situation all series. This time, Love locks him down. Ten seconds on the shot clock and Curry has to give it up to Green, who quickly gives it back. Seven seconds on the clock. Curry and Love start to dance. Curry can’t manage to shake the infamously-clunky, 6’10” Love, and throws up what amounts to a 26-foot teardrop. Clank. LeBron rebound. Cavs ball. Thirty seconds left. Here is where things start to get surreal. Kyrie receives the ball, sprints up the floor, loses the ball, regains possession, nearly goes out of bounds, and finally tosses it to Love. Twenty-two seconds left. Warriors foul. LeBron passes inbounds to Kyrie in the backcourt, who takes off on a dead sprint towards the hoop. Sixteen seconds left. Pass to LeBron. Twelve seconds left. LeBron rises for a dunk. Foul. Ten seconds left. LeBron is laying on the floor writhing in pain. The bar starts to unravel as LeBron rises to his feet to take the shot. He’s grimacing and grabbing at his shooting wrist. I’m anxiously bouncing up and down and wrapping my arms around whoever is nearest to me. The first free throw goes up and clanks off the back of the rim. At this point, a haunting thought crosses my mind: “This isn’t over. Oh my gosh, Curry is going to find a way to win this game, and I’ll be living in The Drive or The Shot or The Fumble. This is how it happens.” Before terror sets in, the second free throw goes up and rattles home. The Cavs are up by four with 10.6 seconds left, and the crowd in the bar is beginning to sense it. Warriors timeout. It was what I had spent 12 years dreaming about and six days forcing myself not to imagine, not wanting to be completely crushed if we lost. The moment hit me like a ton of bricks. I can’t see the last 2.5 seconds of the game or the ensuing celebration. The bar is bouncing up and down, and beer is spraying everywhere. It still doesn’t feel real. I grab Matt, and we both start to cry. It’s sad, lame, and pathetic, and I regret none of it. The weight of a whole city lifted in sixty seconds. I glance back up at the TV to see LeBron on the floor with his face in his hands, sobbing. What is happening? I don’t know what to do. This can’t be real. The first time I cried over Cleveland sports were tears of joy. Take that, Curse. I hug everyone I can reach and look at Matt and yell, “Let’s go!” He laughs, so I yell again, this time pointing towards the door, “No, let’s go!” I hop down the steps leading towards the back door of the bar and sprint straight onto Lakeside Avenue. It’s a good thing downtown is too clogged for any traffic because I easily could’ve gotten hit by a truck with how recklessly I run into the street, yelling at the top of my lungs. At this point, I finally take the opportunity to throw on my Kyrie jersey, and I round the corner onto West 6th. If you’re a Cleveland sports fan reading this, I hope you had the opportunity to sprint down the center of a downtown street on June 19, 2016. It was everything I hoped for, and more. I was high-fiving strangers. A random man leapt into my arms. Our group got split up. A mass of people had flowed out of the bars and surrounded a police car with its lights on. A group of people was dancing on top of a taxi, which seemed like an issue until I noticed the cab driver celebrating in the front seat. Ambulances slowly made their way through the crowds with their sirens on as paramedics leaned out of the window to high-five passersby. A guy dangled over St. Clair, doing pull-ups between traffic lights. Rumors began to swirl that someone had hijacked a fire truck. Cleveland Police assured us the rumor was false. Kinda. I don’t know how many people I high-fived, but it had to be four figures. 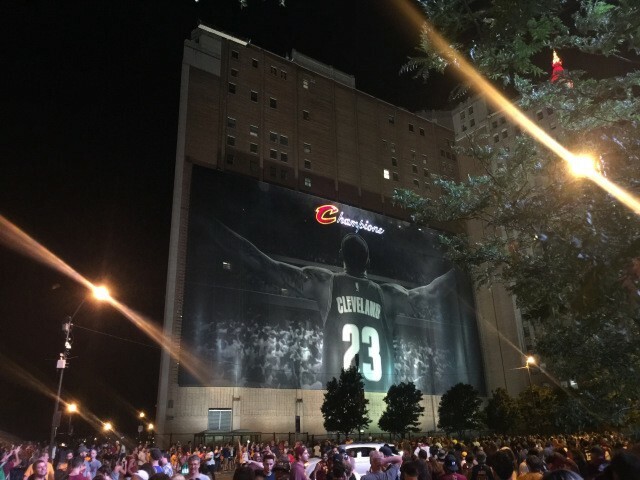 The infamous LeBron banner across from The Q had been adorned with a laser projection, crowning the world’s newest championship city. People cheered. Others took photos in front of it. Many just stood and gawked. It was the happiest crowd I’d ever seen. There was no fighting or anger. Everyone was either cheering, bawling their eyes out, or watching the celebration in a state of shock. As the rest of the country joked about Cleveland burning itself to the ground, Cleveland police made just five arrests. The night was a 10/10 experience. I highly recommend it. It was one of the happiest nights of my life. A city I’ve loved with all my heart for 12 of my 23 years was finally able to shake off its demons, and I was right there in the middle of it. Things immediately felt different. 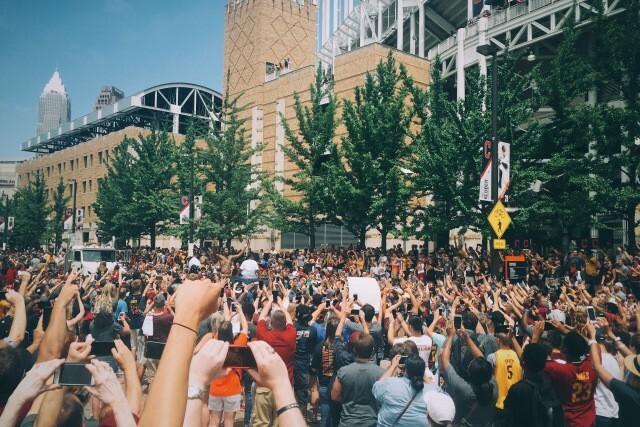 People who say that sports don’t matter haven’t been to Cleveland and definitely didn’t watch the championship parade. Cleveland sits in Cuyahoga County, which has a population of 1.26 million people. There were 1.3 million people at the championship parade. For the afternoon, Cleveland was larger than Dallas and nine US states. It was the 2nd largest sports gathering (per capita) in recorded history and the largest in the history of basketball. The parade drew more people than the marriage of Charles and Diana, the marriage of William and Kate, or Princess Diana’s funeral. I’ve never seen so many people in my life. City officials apparently didn’t feel the need to barricade the parade route, so fans swarmed the vehicles carrying the players. I stood ten feet from LeBron as he slowly made his way through the streets of Cleveland, having finally cemented his legacy. The Cavs will win the NBA Championship next June, but not if these t-shirts from hell have anything to say about it. I was 100% right and 100% wrong in the same sentence. Cleveland winning a championship is so monumentally unlikely that it might as well just happen in an absurd way, like coming back from down 3–1 to win Game 7 in Oakland. If we ever win a championship, it’s going to be in some hilariously improbable fashion. And that’s how it happened. It was such a storybook ending that ESPN is swapping out the ending of the Believeland documentary. Nothing in the history of Cleveland sports has been easy. It’s how it works. LeBron knew it when he returned to Cleveland, writing, “In Northeast Ohio, nothing is given. Everything is earned.” That’s how the Finals were. For a city that’s taken the hard road throughout its history, the Finals were a perfect microcosm of that. It’s how it works in Cleveland, The City of Champions. Difficult, messy, heartbreaking, and worth it. Game photos via nba.com, Cleveland photos and Vines via Spencer Tuckerman.